Comfort House Sun Theme Arch Address Sign - - custom made May The Sun Never Set On address sign for your home or business with a sun image inside the arch. Personalized with your house number and street name. Made in the USA. The saying May The Sun Never . . is standard on all signs. This wall mount arch sign holds your street number on line 1 and your street on line 2. Line 1 holds up to four (4) 3" numbers. Line two holds up twelve (12) 3/4" letters. Note: the style number in the lower left on the sample sign is for internal use only and is not engraved into your custom sign. 8" x 11.75" arch address sign made from sturdy and UV-stabilized laminated acrylic. Dimensions: 8"W x 11.75"H x 1/8". 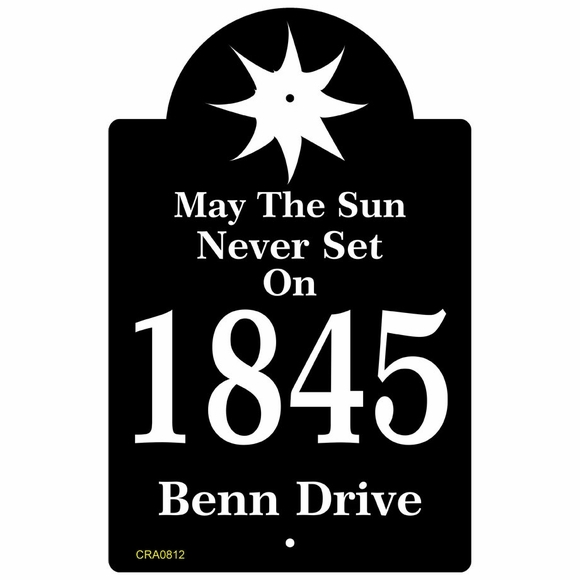 Sunshine theme personalized address plaque for your residence or business. Wall-mount arch shape two-line sign. Made in USA.